The play "Kama-ga-Fuchi Futatsu Domoe" (three acts) was originally written for the puppet theater and staged for the first time in Ôsaka at the Toyotakeza in the 7th lunar month of 1737. It was adapted for Kabuki 19 years later and staged for the first time in Ôsaka at the Kado no Shibai in the 9th lunar month of 1756 (casting unknown). In modern times, it has been staged only once since WWII, in July 1968 at the Kabukiza [casting]. The Kama-ga-Fuchi of the title was an area south of Kyôto, near Jûjô, at the confluence of the Kamo River and the Takase River. More precisely the word kama in Kama-ga-Fuchi meant an iron vat which is used at the end of the play to execute Ishikawa Goemon. The original puppet drama was in 3 acts. The current Kabuki version is also in 3 acts, comprising all the scenes from the second and the third acts of the puppet drama, from "Mamako Ijime" to "Kamairi". The first act, which included the scene at the Shimabara pleasure quarters where Ishikawa Goemon fell in love with the courtesan Takigawa, has gone into oblivion. Ishikawa Goemon lives with his wife Otaki, a former Shimabara courtesan who used to be named Takigawa. They have recently been joined by Goemon's son Goroichi. Goroichi's mother is Oritsu, the previous wife of Goemon. As Goroichi is not her child, Otaki acts very harshly towards him. She appears to be a mean stepmother. However, the truth is that she has some sympathy for Goroichi and does not want him to follow in his father's footsteps and become a thief. If Goroichi remains with Goemon, his future is very likely to be violent and dark . By bullying the boy, she hopes to force him to leave and return to his real mother to lead an honest life. No one else is aware of her true intentions. Some kind neighbors bring back Goroichi who has gone to them in tears after being scolded by Otaki. They ask her to forgive Goroichi and to try to be more lenient towards him. After they have gone, Goroichi tries to appease Otaki by bringing her a cup of tea. Otaki coldly refuses to accept it, and the cup gets spilt on a garment she is sewing for Goemon. This is a good excuse to scold Goroichi even more harshly. At this point, Kobuna  Gengorô arrives. He is a member of Goemon's group of thieves and he is over-interested in Otaki. Goroichi senses that the man is after his stepmother, who of course belongs to his father Goemon. On Gengorô's orders he unwillingly retires to another room. Gengorô tries to seduce Otaki but she successfully rebuffs him by telling him that she has just heard her husband Goemon calling her. Gengorô believes her and hastily leaves. Meanwhile, Goroichi is lost in thought. He would like to stay with his father but feels definitively unwanted by Otaki. Taking shelter with his real mother is too difficult as she is now married to another man. Unable to decide what he ought to do, he is weeping when his father comes out from an adjoining room. Goemon understands Goroichi's position and feels sorry for his son, but actually, he is not in a position to protest too strongly to Otaki. Otaki's father, an evil old man named Sanni Gorobê, is a scoundrel who would not hesitate to betray Goemon to the authorities if his relationship with Otaki started to deteriorate due to problems occasioned by his son. Goemon gently asks Goroichi to bear Otaki's harshness, and Goroichi, out of love for his father, agrees. After Goemon's departure, Gorobê appears on stage. He has come to extort money from his own daughter. Otaki meets him but refuses to give him anything. Her evil father threatens to expose Goemon as a robber. Otaki reminds him that, when Gorobê killed a man in a fight a year ago, Goemon was the one who paid a large sum of money in order to save Gorobê's life. Gorobê backs off just a little bit and he promises to stop bothering them about loans after this one last time. He goes off to another room to wait for Goemon's return, taking Otaki with him. Unfortunately, Goroichi thinks that the man leading his stepmother to another room is Gengorô. He follows them silently, taking his father's sword with him as he plans to stab Gengorô. Hearing the sound of footsteps outside and convinced that there is no time to lose, he hastily thrusts Goemon's sword through the shôji. It is Otaki, however, and not the man, who is stabbed by the blade. At the same time, Goemon comes hurrying to the scene of the crime. Goemon angrily reprimands Goroichi for stabbing his stepmother. She may have ill-treated him but that is no excuse to strike her. Goroichi answers that his prime intention was to kill Gengorô who was about to commit adultery with Otaki. The bleeding Otaki, however, explains that it was her father who was with her. She also says that Goroichi will now face the death penalty . The only way to save the boy is to tell the authorities that Goemon has stabbed her to punish her for adultery . Goemon can't understand why she is worrying about Goroichi. Otaki explains that she does not want him to follow in Goemon's footsteps. Goemon and Goroichi are grieved at their misunderstanding of Otaki's true intentions. Otaki's final moments arrive, and she dies as Goroichi clings to her, weeping. Gorobê comes out of hiding and tries to leave in order to accuse Goroichi of killing his stepmother. Goemon draws his sword and fatally strikes the old scoundrel. Then, as now both he and Goroichi are guilty of killing a parent, Goroichi his stepmother, and Goemon his father-in-law, they have no other option than to flee. At this moment, Gengorô appears, looking for Otaki. He too, is killed by Goemon. The scene is set near the Fuji-no-Mori Shrine, south of Kyôto. Goemon and Goroichi are now two wanted men, furtively fleeing from Kyôto. Goemon has run out of money, and has no other choice than to sell his sword in order to get some. A fine palanquin accompanied by a retinue of samurai appears on stage. Goemon stops it and politely asks to have his sword purchased as he is in need of funds. The occupant of the palanquin steps out. He is Iwaki Hyôbu, an old high-ranking samurai of dignified bearing. He inspects Goemon's sword and is flabbergasted to discover that the sword is none other than the one he left with his baby son many years ago. Controlling himself, he asks Goemon how he came to possess it. Goemon replies that it was left with him by his father who abandoned him when he was still a baby. Under the circumstances, Hyôbu finds it impossible to bring their true relationship to light. Instead, he explains that in the past he had an affair with a lady-in-waiting who subsequently gave birth to a beautiful boy. However, due to the strict social rules of the samurai class , he was forced to abandon the baby, leaving a similar sword with it. He later learned that the baby was adopted and brought up by a family of farmers in the province of Kawachi. He has also heard that his son became an outlaw and was banished from Kyôto. He says that he has vowed never to acknowledge such a criminal as his son, but that his heart nevertheless prays for his son's safety. On hearing Hyôbu's tale, Goemon realizes that this old man is his own father, but he too is forced to restrain himself. He simply says that the son would no doubt be deeply affected at hearing such a beautiful tale. Hyôbu, who realizes that the boy with Goemon must be his grandson, calls the lad to him and gives him a wallet full of money. Then, after returning the sword, he re-enters his palanquin and leaves with his retinue of samurai. Hayano Yatôji, leading a group of torite, rushes on stage. They try to arrest Goemon and his son. Goemon says that he will give himself up without a struggle if he is promised that his son will be spared. However, Yatôji refuses his offer saying that Goroichi must be punished for the murder of his stepmother. Goemon, seeing that it is hopeless to negotiate anything, prepares to fight. Goemon, after a fierce fight, has been cornered in the precincts of the Fuji-no-Mori Shrine. A spectacular last-ditch fight between Goemon and Hayano Yatôji's torite ensues. Yatôji himself arrives on the scene and calls on Goemon to surrender as the shrine is completely surrounded and his chances to escape are nil. At this point, Iwaki Hyôbu appears. He says that he has a quarrel to settle with Goemon and asks to be allowed to be the one to capture the larger-than-life thief. Hayano Yatôji, after a little hesitation because of Hyôbu's old age, consents. Then, Hyôbu challenges Goemon. Goemon quickly realizes that Hyôbu is giving him a chance to flee, with the intention of taking his own life afterwards. He makes no effort to run away since filial duty decrees that he cannot allow Hyôbu to sacrifice himself in such a manner. Instead, he asks that Hyôbu's foster son should be called upon to be a substitute for his father in the fight. Iwaki Tomanojô, foster son of Iwaki Hyôbu and husband of Goemon's former wife Oritsu (the real mother of Goroichi), appears on stage. Due to all the complex family relationships, there is a natural bond of sympathy between Goemon and Tomanojô. In particular, Goemon feels himself responsible for having caused Tomanojô to fall from his rank of samurai to the lower rank of merchant. Goemon hopes that by allowing Tomanojô to be credited with the capture of a notorious wanted criminal, Tomanojô will be reinstated to his former rank. Tomanojô understands Goemon's purpose but is unwilling to take advantage of Goemon's desperate situation. However, there is no other solution. Goemon and his son Goroichi are captured and bound with ropes. The scene is set at the dry riverbed (kawara) on the Kamo river near the seventh avenue (Shichijô). Word has gone out that Ishikawa Goemon and his son Goroichi are to be put to death here, at the execution site on the dry riverbed. A large group of people are talking and gossiping about this forthcoming event. Most of them are hinin, who are very sympathetic to Goemon as he has the reputation of robbing the rich to give to the poor. Officials arrive at the riverbed and try to disperse the hinin, saying that Goemon disappeared into thin air when he was bound on a horse, ready to be brought to the execution ground. Consequently only Goroichi has been brought to the site. The officials beat him, trying to make him confess where his father has disappeared to. Goroichi answers that he does not know and the hinin murmur sympathetically. Suddenly, Goemon appears out of thin air right alongside his son. He has used his supernatural powers to disappear and reappear. He is asked why he has reappeared at the execution ground instead of fleeing. Goemon explains that in a moment of weakness, he has remembered his late wife Otaki and he wanted to go to her tombstone for a last prayer. Of course, he could have easily escaped using his supernatural powers but it was out of question to leave his son behind to face his horrible fate alone. Therefore, he has returned and is ready to die. On stage, there is a huge iron vat (kama) of oil and stacks of firewood to heat it. 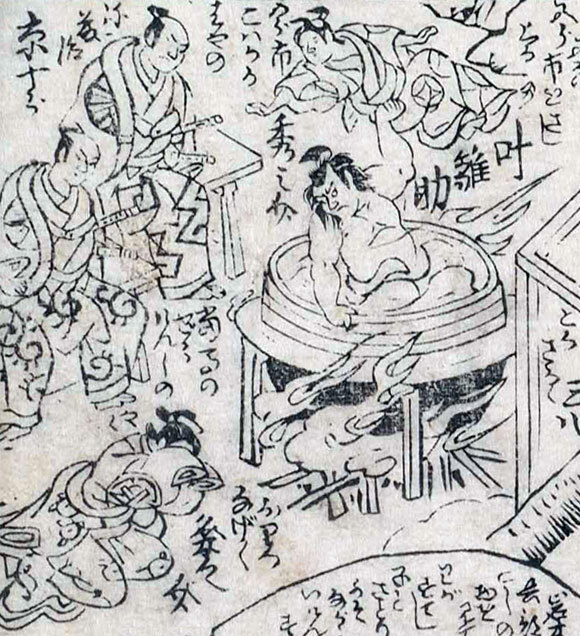 Goemon and his son will be boiled to death (kamairi). Father and son are brought to the site. Hayano Yatôji once more orders Goemon to reveal the names of the members of his gang of thieves. The proud and courageous Goemon refuses, although Iwaki Tomanojô urges him to give his henchmen away in order to save his son. The officials realize that it is useless to question him further. Goemon consoles his frightened and weeping son. Then he grabs Goroichi and leaps into the boiling vat, holding the boy high above his head in order to save him from the hot oil as long as he can. Hyôbu, unable to watch the horrible scene, calls out to Goemon to end the torture of his son by killing him quickly. Goemon summons the strength to plunge Goroichi deep into the vat, killing him instantly. A few minutes later, Goemon too, passes away. This summary has been edited by Marion Hudson. This act is commonly called "Mamako Ijime" ("Stepchild bullying" in English). In Medieval Japan, all the members of the family (spouse and children) of a criminal were punished as well as the culprit. Kobuna literally means small crucian carp. The law was particularly harsh toward crimes committed against parents. In Medieval Japan, in cases of adultery, the law condoned a wronged husband for taking revenge by killing his wife and her lover. In Medieval Japan, he should have been put to death since this kind of love affair between a samurai and a lady-in-waiting was strictly forbidden.